Maren Larae Morris, popularly known as Maren Morris is an American country music singer, songwriter, and a record producer. She rose to prominence after she released her debut single, "My Church", for which she has won a Grammy Award for Best Country Solo Performance. She has also won 2016 CMA Awards for New Artist of the Year, 2017 ACM Awards for New Female Vocalist of the Year, 2017 Radio Disney Music Awards for Best New Country Artist, 2018 Billboard Music Awards for Top Country Female Artist, and several other nominations. Her debut single, "My Church", for which she won a Grammy. Morris was born on 10 April 1990. Her birth name is Maren Larae Morris. She was born to Greg Morris and Kellie Morris. She was born in Arlington, Texas. She holds American nationality. She has a younger sister named Karsen Morris. Her father bought her a guitar when she was 12-years old. Her zodiac sign is Aries. She follows Christianity. She attended the University of North Texas. In 2005, she released her debut album, Walk On. She later released All That It Takes in October 2007, Live Wire in 2011. 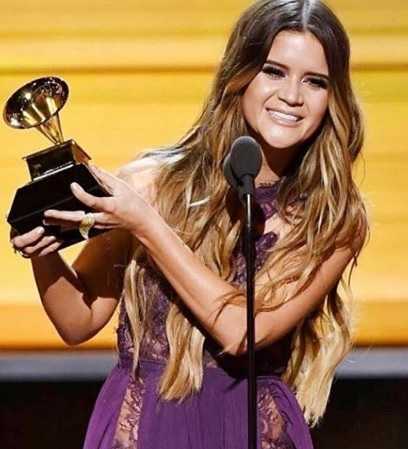 In 2015, she released an eponymous EP, Maren Morris. The album garnered her a major recognition. Following her success with EP, Maren Morris, she signed a record deal with Columbia Nashville in September 2015. In November 2015, she re-released the EP with "My Church" as the lead single. The EP charted at number two on Billboard charts, number one on The Heatseekers chart, and at number 27 on the Country Album chart. Her single, "My Church" won her Grammy Award for Best Country Solo Performance in 2017. In 2016, her major label debut album, Hero was released in 2016, which received critical acclaim. Her album, Hero earned four Grammy Award nominations at the 59th Annual Grammy Awards. She was named Billboard Women in Music 2016 with the Breakthrough Star Award and Music Biz also awarded her Breakthrough Artist Award in 2017. She toured in 2017, Hero Tour, to promote her album. She released a deluxe edition of Hero in March 2017, featuring songs "Bummin' Cigarettes", "Space", and "Company You Keep". She wrote a song "Dear Hate" in a response to the 2017 Las Vegas Strip shooting. She will be one of the performers at Brandi Carlile's upcoming music festival, Girls Just Wanna Weekend, scheduled to take place in January 2019. Maren Morris is a married woman. She is married to fellow country singer Ryan Hurd. They got married on 24 March 2018 in Nashville, Tennessee. She first met him in a co-write back in 2013. They started dating in December 2015. In July 2017, they got engaged. She lives with her husband in Nashville, Tennesse at present. Maren Morris stands at a height of 1.63 m i.e. 5 feet and 4 inches tall. She has a body weight of 117 lbs i.e. 53 kg. She has a slim body. Her body measurement is 33-25-32 inches. She wears a bra of size 32A. She has dark brown eyes and her hair color is dark blonde. She wears a shoe of size 7.5 (US) and a dress of size of 6 (US). Maren Morris is a singer, songwriter, and record producer. Her sole source of income is music. As of 2018, her net worth is estimated at $2 million. When she was a child, she spent most her time at her parent's hair salon. She has written songs for Kelly Clarkson, Tim McGraw, Jessie James Decker and many more.